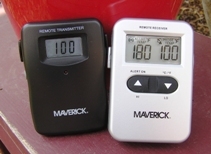 Remote Wireless Cooking Thermometer. Monitor food up to 100 feet away. Receiver displays alert and temperature. Beeps when food is done. Single probe.